This November sees a range of anniversaries and celebrations within the fields of responsible travel and tourism. World Travel Market in London will mark 20 years of Responsible Tourism and celebrate 10 years of World Responsible Tourism Day since the start in 2006. In Siem Reap, the employee-owned and multi award-winning Soria Moria Boutique Hotel celebrates its nine-year anniversary and the not-for-profit social enterprise ConCERT (Connecting Communities Environment and Responsible Tourism) was launched during the World Responsible Tourism Day event in Siem Reap held at Angkor Palace Resort and Spa in 2007. Under the banner ‘Stay longer – experience more’, main focus of the event was to connect local community projects and organisations with tourism businesses and promote some of the many good things going on a grassroots level in Siem Reap. Projects such as The Silk Lab showcased various silk products made by local women, Sam Veasna Center and Osmose work with local communities and wildlife conservation whilst providing unique wildlife viewing trips and local handicrafts woven from water hyacinth. 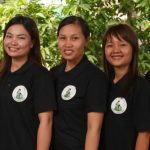 Friends International work with a range of hotels, guesthouses, restaurants and other tourism businesses in Siem Reap, Phnom Penh and Sihanoukville providing information, awareness and training on how to protect children and become ChildSafe certified businesses. Subsequent World Responsible Tourism Day celebrations in Siem Reap has taken various shapes and forms and seen a range of speakers addressing different issues on the local responsible tourism agenda. Leading up to the International Day of Volunteering in 2011, World Responsible Tourism celebrations at Soria Moria put focus on the Think Twice campaign with T-shirts, flyers and posters to create more awareness about issues related to child safety and the issue of giving money to begging children. However cute children might be, begging on the streets will put children in potentially dangerous situations, and the campaign encourages local businesses as well as visitors to read up on the underlying issues and support local businesses and organisations providing work, support and educational opportunities. With the rapid increase in tourism development over the last couple of decades, we have seen some big changes in Siem Reap and Cambodia with both positive and negative impacts as a result. Looking back over the last 10 years – not even mentioning the last 20 years where accommodation options were few and far between – it is astounding to see the sheer amount of new hotels, resorts, local guesthouses and accommodation providers available in Siem Reap. This, of course, has given travellers a wide range of accommodation options, but, at the same time, it puts a lot of pressure on existing properties in an already very competitive and price sensitive market. Staff salaries and minimum wages have been widely discussed and debated in the UK. Many of the same principles and arguments used would apply globally and in Siem Reap in particular. Increased employment is undoubtedly one of the positive impacts of tourism, but with my hoteliers’ hat on, one of the dilemmas with cheap hotels and reduced rates is to gauge where the breaking point is and hotels are still able to pay their staff fair wages whilst remaining competitive. In such a competitive market, using energy efficient light bulbs will help save on energy bills, but light bulbs alone is not enough to entice visitors to stay and stand out from the competition. There are, however, some hotels and restaurants in Siem Reap who are proactive, provide guests with delicious food, great experiences and, at the same time, support the local communities they operate within. We would strongly recommend to use their services, and Haven, Sala Bai, Sister Srey, New Leaf Book Café and Marum Restaurant are but a handful of places where ‘giving something back’ literally tastes very good. Increased traffic and congestion are often mentioned as negative impacts of tourism. When comparing Siem Reap of today to how it was 10 years ago, it’s easy to understand why. Whilst there is not anywhere near the same amount of traffic in Siem Reap as it is in Phnom Penh, Bangkok, Ho Chi Minh City, or London for that matter, some stretches that used to be a leisurely 5-minute drive through some picturesque countryside can now be a 45-minute stop-start experience with a feeling not to dissimilar to the one you get when trying to navigate the M25 and go through the Dartford tunnel during rush hour. A positive, though, is that it has been more focus on cycling and the benefits it brings – both on a personal level and to the environment. The White Bicycles still provides white bicycles for rental at selected outlets in Siem Reap where the profits go to support various community projects. Grasshopper Adventures, for example, is one expert tour provider that offers a range of cycle trips to the magnificent Angkor temples and beyond. From a personal point of view, I think cycling is one of the best ways to get around and soak in the atmosphere of a place. With an increasing number of restrictions on cars, buses and motorised vehicles inside the Angkor Archaeological Park, this is very much the case in Siem Reap. The one single issue that probably has caught the most media attention – and, unfortunately, not always on a positive note – is volunteering and volunteer tourism. What started as a genuine desire to ‘do something good’ and help alleviate poverty in a developing country trying to get back on its feet after years of conflicts and turmoil is now being scrutinised, questioned and criticised from various angles. Much of the criticism is, however, justified. The value of Volunteer Tourism worldwide is estimated to be somewhere between £832 million – £1.3 billion annually, and Cambodia has established itself as one of the most popular places for volunteer tourism. Whilst most volunteers still have a genuine desire to do good, evidence suggest that if it’s not done properly, volunteer tourism can do more harm than good – however good the intentions are. We believe volunteering has got the potential to bring many benefits to local communities and volunteers themselves, and being featured in the Responsible Tourism agenda at the World Travel Market in London strongly suggests that volunteering and volunteer tourism still is an important topic that needs addressing and monitoring at different stages in the process. The main focus for this year’s World Responsible Tourism Day in Siem Reap is reducing the amount of plastic waste and number of plastic bags and plastic bottles going to landfill. Plastic waste is a global issue. As the last country in the UK, a 5p charge for plastic bags was introduced in England on 5 October 2015. After some time settling in, the government hope to see an 80% reduction in plastic bag use in supermarkets and, over the the next decade, create £13m in carbon savings. Those of you who have been to Cambodia and Southeast Asia know how easy it can be to generate a whole pile of plastic. It’s important to drink enough water and water is easily available in plastic bottles. The fresh fruit from street vendors is absolutely delicious, but, more often than not, it’s served in little plastic bags. When shopping at local markets, people frequently end up with big plastic bags full of little plastic bags. Trying to address the issue with plastic waste, representatives from the tourism and hospitality industry in Siem Reap have joined forces and aim to reduce the use of plastic bottles by providing and encouraging the use of refillable bottles. Visitors to Siem Reap will have an opportunity to purchase a refillable drinking bottle and participating hotels, restaurants and accommodation providers will then refill the bottles for free. ‘The campaign has had a very positive uptake so far’ says Christian De Boer, General Manager of Jaya House Hotel in Siem Reap. ‘Various illustrations in Khmer explaining the longevity of plastic have been prepared and shared 1000s of times on social media. The same illustrations are now also used in classrooms as educational material’. We genuinely believe that awareness and education are important building blocks in sustainable development. We also appreciate that tourism arrivals is likely to continue its rapid increase in Siem Reap and Cambodia and, as such, put pressure on the local infrastructure and environment. There will undoubtedly be some challenges ahead, but its very positive to see more focus and increased awareness on local issues. Therefore, we celebrate World Responsible Tourism Day and hope the industry can play a part to ensure both travellers and locals alike will continue to enjoy Siem Reap – and destinations around the world – also in the future. Read more about World Responsible Tourism Day on www.wtmresponsibletourism.com and follow the conversation on Twitter @WTM_WRTD. For comments and more information on the campaign for reusable drinking bottles in Siem Reap, see #ReFillNotLandfill. Update: Acknowledged for their efforts and adding to Cambodia’s Responsible Tourism credentials, Sam Veasna Center won Gold for Contribution to Wildlife Conservation and Friends International’s Child Safe Movement won Gold for Responsible Tourism Campaign in this year’s World Responsible Tourism Awards at the World Travel Market in London. Passionate about for responsible travel and sustainable development, Thomas has worked extensively with SME tourism businesses to help them engage in responsible tourism activities and his skills extend across the CSR agenda.